As Indian designers put their faith in the artistry of humble craftsmen, time-tested techniques, and simple, hand-woven fabrics, the fashion scene in India is witnessing the emergence of a new kind of tradition-inspired haute couture. It is rare that the present makes way for the past and when it does, what emerges is a gorgeous tale, particularly beautiful if the past is rich with tradition. 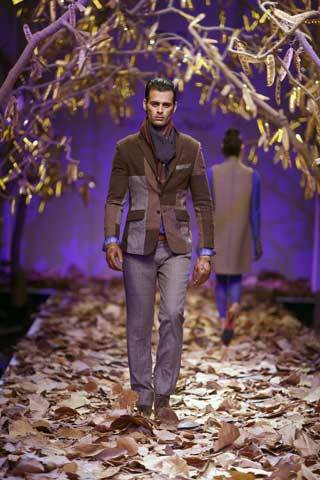 What has happened on the Indian fashion scene in the last few years is just such an emergence. Rich colors, intricate weaves, traditional patterns, age-old techniques, fabulous prints and humble handlooms make up the tale of the revival of traditional Indian textiles on the ramp. As Indian designers bring back all things old and classic to the ramp, our wardrobes have undergone an Indian makeover. The Phulkari of Punjab, Muslin from Madhya Pradesh, Ikats from Andhra Pradesh and Orissa, tie-and-dye from Rajasthan, jacquards from Uttar Pradesh, silk brocades from Varanasi and more are writing the fashion forecast now. In the vanguard of this revival is textile diva designer Anuradha Vakil, whose love of Indian textiles and respect for the artisans come alive in her creations. Her signature style lies in using of traditional crafts and giving them a contemporary look. Vakil, who established her design firm, Noor, in 1994, credits her designs to the indigenous crafts and the craftsmen from every state of India who form her team. Left: From the Anuradha Ramam collection. She credits artisans and weavers of Andhra Pradesh and West Bengal with her success. Designer Anuradha Ramam, too, credits the artisans and weavers of Andhra Pradesh and West Bengal with her success. “I am driven by a passion to preserve the old crafts and heritage of my country and present it to the people of today with a contemporary touch,” says Ramam, who grew up in Haldia, West Bengal. “Our work begins at the yarn stage followed by determining the cotton count and selecting the color. The design is then finalized. The weavers are actively involved at every stage of the process,” says Ramam. Every single creation of hers is hand-woven. “We consciously avoid the usage of any machinery, except the barely necessary ones, to preserve the uniqueness of each and every design.” As a result, the weave pattern and the colors of each batch of her products vary. This, in turn, helps in retaining the exclusiveness of the design. Right: From the Deepika Govind collection. “Fashion is no longer about design but about ecology, chemistry, socialism and humanity, more serious parameters than aesthetics and trends,” says this designer. Another devotee of tradition is designer Deepika Govind who confesses that she loves India and more than that she loves being an Indian. “My commitment is to create design that improves the quality of life. My own philosophy is to design ensembles that feel freedom, a democratic design. I am not into trends. My work is about beauty and elegance and the possibility of living with less. Fashion is no longer about design but about ecology, chemistry, socialism and humanity, more serious parameters than aesthetics and trends.” She says she would love to be a part of the Indian arts and crafts movement, where all the arts could be harmonized with advances in technology. Her designs also reflect her romancing of the khadi, the fabric of India’s freedom struggle. “We contemporized it by making it supple and drapey with great strength and the ability to adapt to modern silhouettes,” she says. Her Spring/Summer 2013 line is called Khadi Kool. Govind’s other works include Denim Green, the creation of a denim line with hand-woven denim dyed in pure indigo, and Pop Patola, a reinvention of the Patola weave with pop-art motifs. Another name that springs instantly to mind when you think of khadi is that of Sabyasachi Mukherjee, who strongly feels that relying on the strength of our Indian fabrics is the best way to tackle the invasion of global brands. Designer Rahul Mishra, too, has put his faith in the rich mines of karigars, fabrics and prints. Mishra is known for his commitment towards empowering the crafts community of India. In the past, he has collaborated with the Taj group of hotels to help preserve the art of the Ikat weavers of Pochampally. In 2011 a documentary made on the handlooms of India (a production of UNESCO and the Ministry of Textiles, India) profiled his work. At the recent Wills Lifestyle India Fashion Week (WLIFW) Mishra presented garments created from the traditional fabric of Kerala, followed by a line of khadi-inspired clothes. Left: From Raisons, a luxury handloom brand that is synonymous with reviving old Indian techniques of weaving and embroidery like Kantha, Lucknowi, Sozni, Kasuti, Gota Patti, Aari, and Phulkari. Right: Rajesh Pratap Singh‘s designs exemplify traditional tailoring in a contemporary light. Rajesh Pratap Singh‘s Autumn/Winter 2013 collection is a testament to rural India and exemplifies traditional tailoring in a contemporary light. “An exploration of the various techniques of making wool from felting to knitting, from weaving on hi-tech looms to weaving on basic handlooms by high-skill weavers for Ikat weaves, wool yarn embroideries, tweeds, wool patchwork appliqués and embroideries defines the line,” he says. For Singh, the first brand ambassador of Woolmark, a textile fiber brand, the work that began with manipulation of merino wool resulted in ensembles for the future with a sense of the present, deeply rooted in India. WLIFW 2013 had another true revivalist, designer Anju Modi. Modi’s collection, titled Steel Magnolia, used hand-woven fabrics from Kutch, Benares, Chanderi, Venkatgiri, Kashmir, etc. Modi is also known for working with master artisans across the country. On her latest collection, she says, “I was fascinated with the perception of strength and fragility, like the Pashmina is so soft but it can take on the weight of zari.” Samanth Chauhan, known for his passion for the Bhagalpur weaving tradition, presented his Rajputana Poshak collection at WLIFW 2013. Needless to say the models sported bandhgalas, angrakhas, saaris and lehengas, all garments crafted using Bhagalpur silk as the core fabric. In addition, hand-woven golden zari-wrapped silk was fused and textured to offer opulence to the designs. Based in New Delhi, Purva Grover is a journalist and editor who writes about art, fashion, cinema, food, television, and people.